A lot has changed in the life of Noname since the release of 2016’s ‘Telephone’ cemented her as one of the most pivotal rappers out of Chicago. The success of her project, embarking on solo tours, and moving to LA have all escalated the anticipation for her next move, which arrives today in the form of ‘Room 25’. 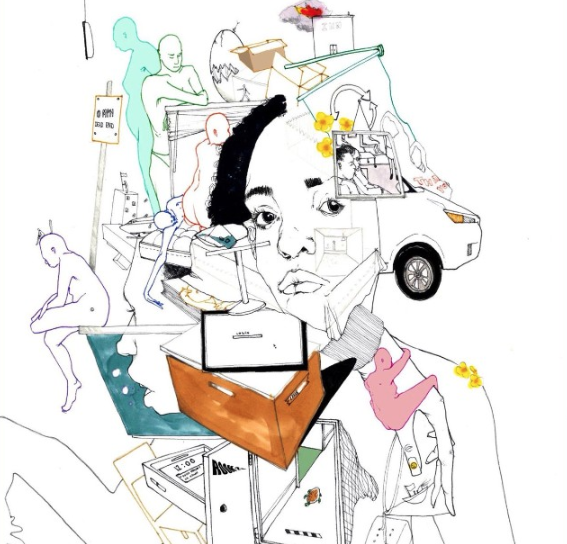 The formative experiences that have occurred since ‘Telephone’ materialize in one way or another on ‘Room 25’, and Noname’s quick to remind us of her prowess as a raw storyteller. While Noname usually thrives off anonymity, selective about what music she puts out and how much exposure her public persona garners, she knows how to let listeners in when she feels like it. When she does open the door, you’re greeted by a comforting intimacy and an off-beat sense of humor underscoring the personal struggles and social commentary that follow. I’ve only made my way through the entire album a couple times so far, but the rewind button has already gotten some heavy-use as I try and keep up with the Southside wordsmith’s stream of consciousness. As always, she keeps her circle of collaborators tight, calling in longtime friends and hometown heroes to help her out. Phoelix handles the majority of the lush, lively production, Ravyn Lenae lends her timeless voice on “Montego Bae”, and Saba comes through with supernatural lung capacity on “Ace”. Taking time for herself has no doubt paid off for Noname, and with ‘Room 25’, her imaginative mind grows even more colorful.